The Ramblings of an Endurance Junkie: Ohhhhh.....it's race season! After a steady March and finally getting back into the pool, April was a bit of a let down training wise. A week away to the Motherland is never good for training so I took it as a recovery week of virtually nothing bar socializing and not getting much sleep! 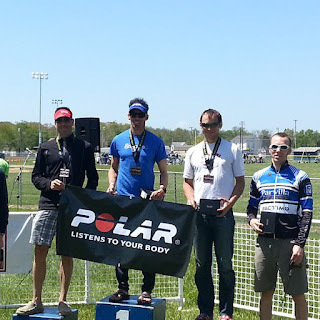 It was with some trepidation that the New Jersey Devilman triathlon came around on May 5th. The first triathlon of the season and a good way to see where I was.....and I wasn't expecting much. The weather was a little less than idea, following the pattern for a colder Spring than usual, it was a blustery and cold morning as we headed to Cedarville, NJ. The racing field looked stacked with at least three people who had won their AG at various 70.3m and Ironman's in the past few year. The swim was pretty standard for me, coming out in the mid-teen's placing and a little way back from the fishes before hopping on the bike for the 40mile ride. A couple of out and back's with the goal of hitting 250watts as an average on the flat course. I moved up some spots on the bike, which I ended up being pleased with as I felt a little sluggish on the bike.....I did average 247watts so hit the plan pretty well. Heading out onto the run, the sun came out and I was 8th. With a 9mile dead flat course ahead of me I might as well let rip and see what could happen. Fortunately the running gods were with me and I felt awesome on the run ripping through the first 3miles at sub 6min/miles and having some people ahead as motivation. At the turnaround I was still in 8th but those in 5th-7th were in sight. The headwind slowed me a bit but I ended up with the 2nd fastest run (behind the winner) and moved up to 5th and the last podium spot. All in all a good first race of the season but gives me plenty to think about as the goal races are coming up....Eagleman 70.3 on June 9th and IM Louisville on August 25th. But before IM Louisville, I have this thing called the Total 200.....a 200mile ride in one day from DC to the southern point of Maryland and back!